Farnborough is still the site of the "Farnborough Air Show", which takes place on the airfield that was once the Royal Aircraft Establishment, or	RAE. You recognise it, as you drive by between Farnham and Camberley, by the great grey corrugated iron building with a clock on top. No-one is there now to "fettle for the great grey dray-horse his bright and battering sandal". In the 1950s the RAE was a major local employer, funded by the Ministry of Supply, and was a world authority on all aeronautical matters. Every year, 30 'apprentices' were admitted, who studied at the taxpayer's expense for five years, receiving accommodation, pocket money, and an unparalleled education in Aeronautical Engineering. These apprenticeships were awarded by competitive examination (like Strephon's House of Lords) and interview. 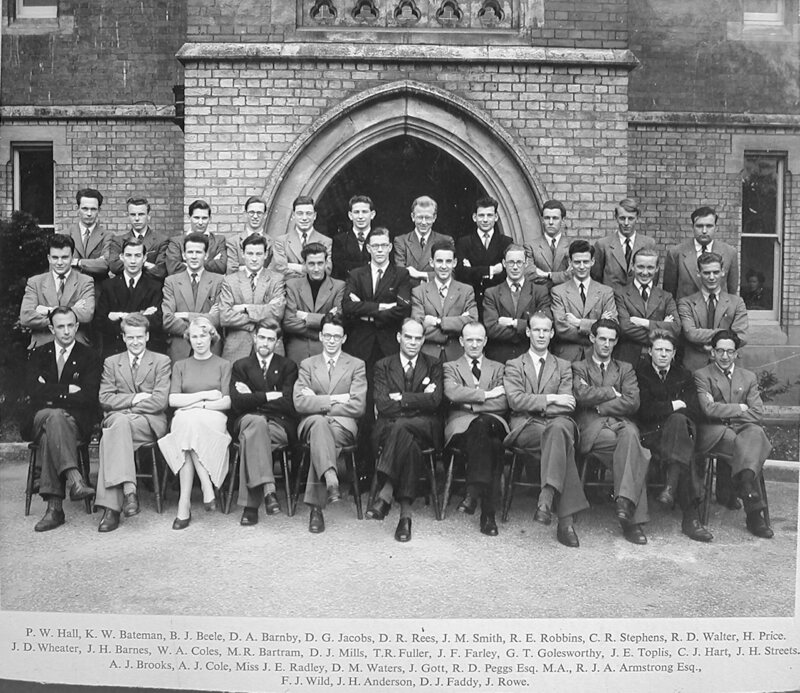 In 1950 Joe Cox came top of about 500 hopefuls, I was about number 28, and we all settled down in the Grange Hostel. We studied at the RAE Technical College (formerly the convent where I had been baptised) and worked in various parts of the RAE itself. 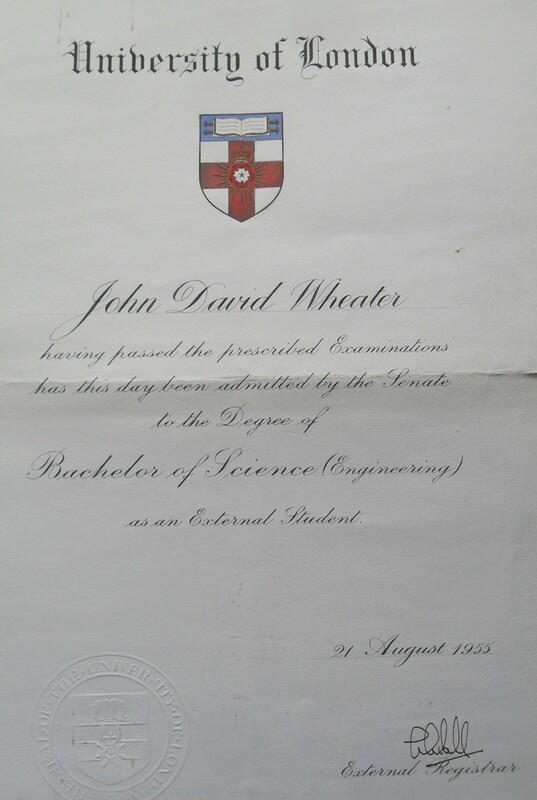 degree granted externally by the University of London. (This photo is interesting, as in 2013 it was chosen by Google to be the first image for "RAE Farnborough". See here for a possible reason. 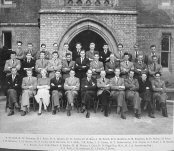 Here is a list of all student apprentices who started in 1950, and I have some memories, 50 years later, about some of the people in the picture. Often, in the department to which a student was assigned for a month or so, life was boring. I remember my time spent in the electrical supply substation, where there was literally nothing to do. But it was a lottery, and it chanced that I worked on the Comet accident investigation in 1954. Just after my time in the Accident Investigation Department, during which I inspected the grisly wreckage of many a Meteor, I started flying in one, when assigned to Gerard's research unit in the Armaments Department. He was the inventor of a wartime gunsight which had been a great success; thus he was given his head for a new gunsight, which was flight tested in two 2-seat Meteors. These flew one behind the other, and each carried an observer in the rear cockpit. The front plane was fitted with a pair of Verey pistols fired by the observer. He fired two puffs at an agreed time interval. The observer in the rear plane started the gunsight mechanism when the first puff passed, and the pilot in the rear plane was supposed to keep the second puff lined up in the gunsight. I did many flights as one or the other observer. The rear observer had a more exciting time, as the prototype gunsight never worked properly, and as the pilot did his best to keep the puff in sight, so the plane would lurch about and be subject to the excessive G-forces which had broken the Meteors I had seen on my previous assignment. It was a privilege though to do that flying in Gerard's department. The pilots were RAF, assigned to the RAE, and after the experiment had ended were quite happy to hand over the controls for pleasure flying by the lucky young apprentice. The Comet was a tragedy for De Havilland and for the country, but two years earlier, in 1952, we had a lesser tragedy, also for De Havilland, but this time particular to Farnborough. The 'Air Show' was then known as the 'SBAC Show', for British Aircraft Constructors to show their stuff (no foreign aircraft were shown). In 1952 'breaking the sound barrier' was seen as rather romantic, and featured in the flying displays. John Derry did it for us in the DH110, and then died as his aircraft shattered in full view of the crowd. Apprentices could always get in to the show, on all days, and on that day I was beside the main runway. Looking up we heard a crack, and saw the aircraft as it were hanging in the air. Then we saw the two engines travelling separately across the sky. Derry and his observer had been killed by the breakup of their aircraft, then by ill luck the engines, separating from the destroyed airframe, carrying on through the air, landed on top of a dense crowd of spectators. Thirty were killed by the impact. The wreckage was recovered to an Accident Investigation hangar, and two years later, during my stint there, Fred Jones put my finger on the very spot where the DH110 started to break up. He also told me the grisly fact that of course the engines had to be looked at in detail, not knowing the cause at first. And these engines, being still packed with human remains, had to be regularly 'hosed down'. In 1952 again, no sooner had Derry lost his life in the DH110, than Neville Duke took off in the Hawker P1067 and gave another sound-barrier-cracking display, with high-speed low-level passes along the main runway. For this act of courage he received a written commendation from Churchill. I saw this letter when Duke decided many years later to sell it at auction. This account suggests a whiff of death about my time at the RAE - the Comet, the DH110 accident, the crashed Meteors during Accident Investigation. And, two fellows were killed in motorcycle accidents. But it was not so. The Reaper is a star, and we remember him when picking out the highlights of half a decade, but there were endless hours - keeping awake during Structures lectures, struggling over my drawing, making my wooden toolbox, calibrating the Hussenot recorders in Aero Flight; and hours every weekend on Rugby pitches, and crushing into the Farnborough Town Hall dances.